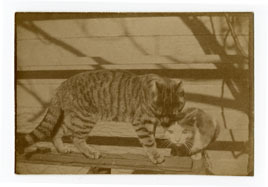 Out of some 600 items in HSP’s collection of cased photographs, the very first one I opened was an absolute gem. 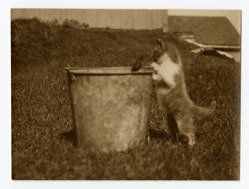 My work lets me examine and admire many old photographs, but never before had I encountered one with its own accompanying love letter which brought the photograph to life. By the time I had finished the transcription I was smitten! Not only did I have the name of the woman depicted in the photograph—Fanny—I had in front of me a letter, written to her sweetheart in her own delicate, cursive penmanship over 150 years ago. Although I am a passionate admirer of all things photographic, I am by no means any less enthralled by the romantic nature of this love letter. 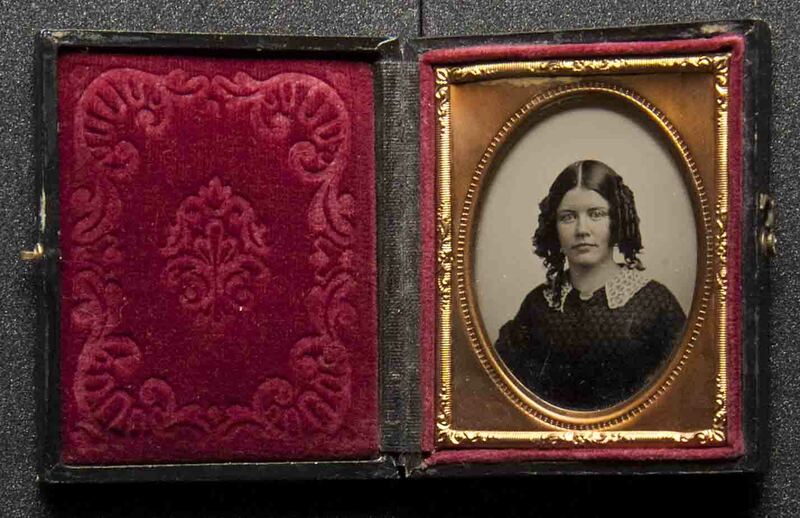 But what I found particularly striking was the way Fanny’s letter put into words the value such an object—a photograph—held in the mid 1850s, when photography was still only in its youth. 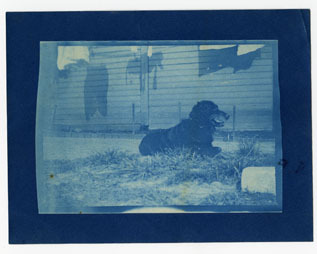 Fanny writes, “May this picture speak” and “may it breathe” as though, to her, the photograph was so vibrant and life-like that it had a voice and breath all its own, to carry across a great distance the sender’s fondest affections and prayers. Such was the value of these early photographs in a time, long before internet, or even telephones were invented, when travel meant great distances and time separated loved ones. 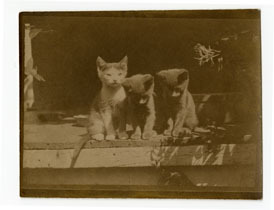 The fact that these fragile images—on breakable glass or easily scratched emulsions—created a need for a whole industry of case-making designed to house and protect them speaks volumes to how cherished these early photographs were to those who commissioned a photographer’s services, and to those who became the lucky recipients of the final product. I have read, in my study of photographic history, many tracts written by practitioners of the photographic arts, expounding upon the wonders and inherent value of the photograph. But never, before this, have I seen such an eloquently written piece that so succinctly, and from the heart, expresses the social value of the photograph in its earliest days. 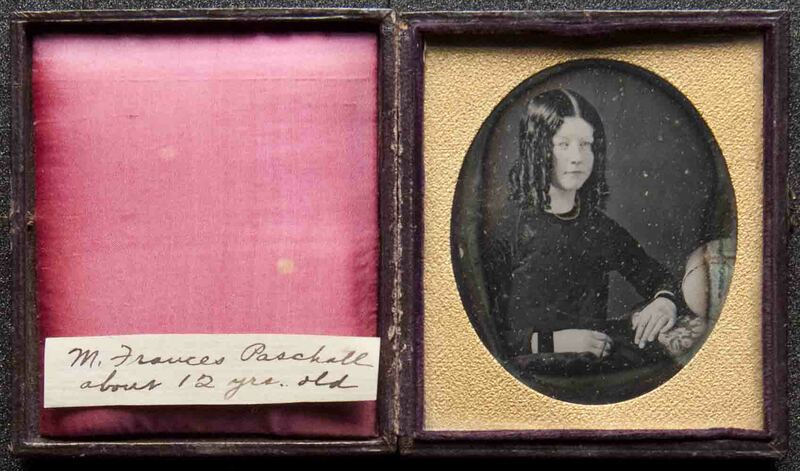 As a happy end-note, I am thrilled to report that soon after I discovered the full identities of Fanny and her Robert when I found two more cased photographs of Fanny, as well as two cased photographs of her sweetheart Robert in HSP’s cased photographs collection. 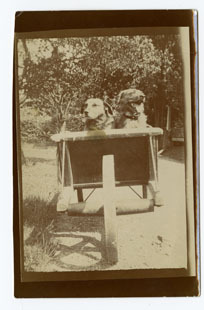 Apparently they were married on June 24, 1858, and obviously the photographs remained cherished items as they were donated to HSP by Fanny and Robert’s daughter Anne in 1931, some 73 years after they were first taken. 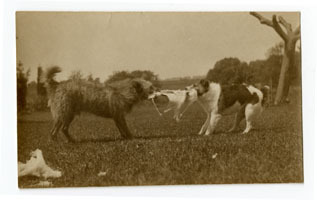 HSP’s cased photographs collection (Collection 3139) is now accessible on HSP’s website. 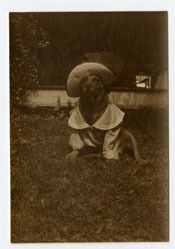 April 21, 2010 by Cary H.
How to dress your dog in a bonnet, and other cute distractions courtesy of the Fenton and Remak family. 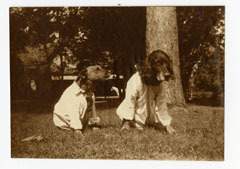 I was going to start this blog post with a grandiose essay on the centuries-old relationship between man and dog that expounded upon some of the greatest philosophical thoughts of our time. This was going to be followed by an exposition on the transformation of fashion in early 20th century America. As much as I’d like to just post a bunch of animal images, a little explanation is required. 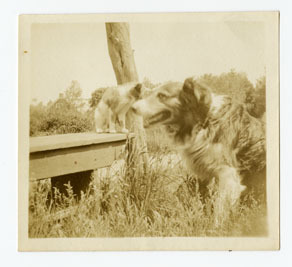 These pictures are from the Fenton and Remak families papers (#3148), a collection I recently finished processing. The Fentons and Remaks were joined in 1885 with the marriage of Thomas Hanover Fenton (1856-1929) and Lizzie Spear Remak (b. 1857). Fenton worked much of his life as an opthamologist in Philadelphia; Lizzie descended from Gustavus Remak, a prominent local lawyer, and Susan M. Scott Remak, a published writer and poet. 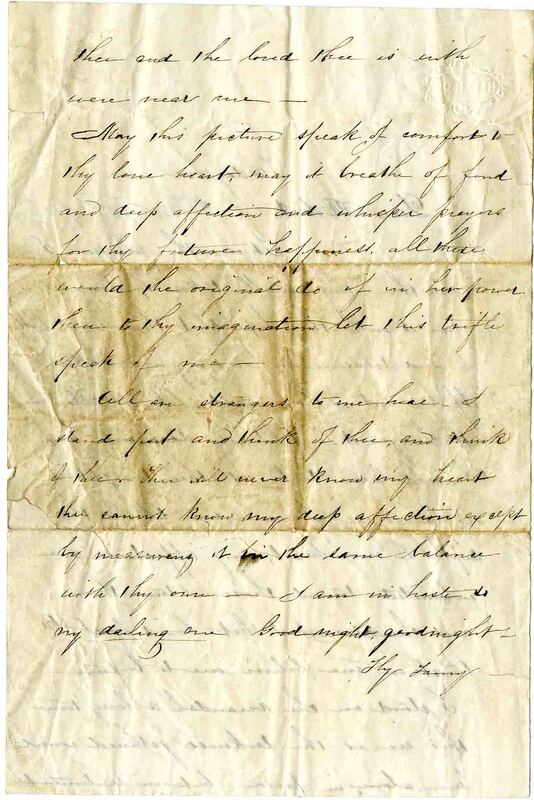 Overall, the collection is very rich in genealogical information, particularly on the Remak side since there are several folders of family history notes made by Susan Remak in preparation for her application to the Daughters of the American Revolution. 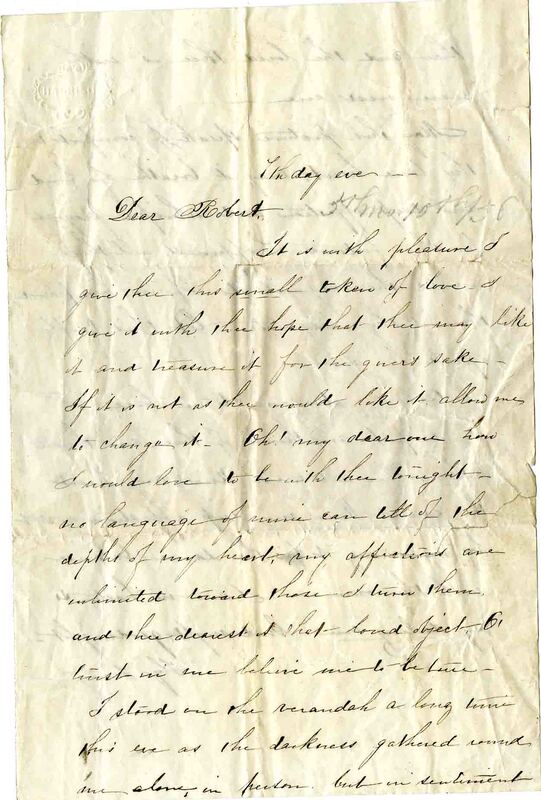 There are fewer genealogical materials from the Fenton side; however, there is a significant collection of personal letters received by Doris Fenton (b. 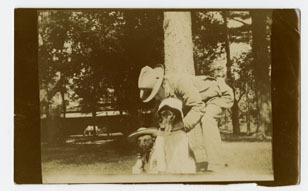 1891), Thomas and Lizzie’s second daughter and once professor of English at Beaver College (now Arcadia University). There are also many photographs depicting the sculptural works of their eldest daughter and well-known Philadelphia artist Beatrice Fenton (1887-1983). The finding aid for the Fenton and Remak families papers is online; a paper copy is also available in our library.